With more than 1,000 restaurants, Wichita always has a new eatery or culinary creation to give visitors and locals fun food experiences. But for 10 days in January, you can make food memories by enjoying exclusive menus at more than 30 of the city’s top restaurants while helping raise money for a great cause. The fourth edition of Wichita Restaurant Week is set for Jan. 20-29, 2017. When you order from a participating restaurant’s special prix fixe menu, 10 percent will go to support Boys & Girls Club of South Central Kansas. It’s a great time to try a restaurant new to you, support one of your favorite chefs or explore why Wichita was called a “Top 10 foodie city” by Livability.com. There are several changes to this year’s event, which is coordinated by Visit Wichita and the Kansas Restaurant & Hospitality Association. Ten restaurants with a total of 12 locations that did not participate last year have joined in to give diners more than 30 venue choices, and each restaurant will offer fixed price menus at either a $15 or $30 price point. The restaurants: Organizers have recruited a diverse group of restaurants to offer a variety of lunch and dinner options. 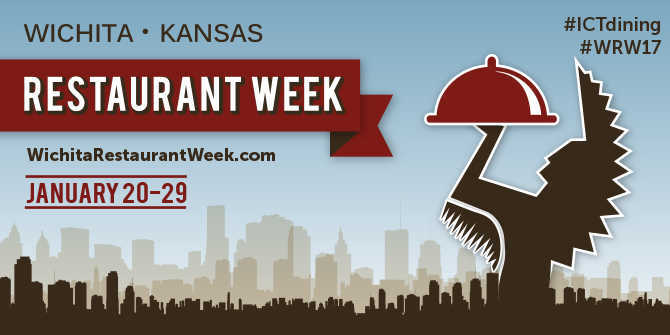 Click on the links below to learn more about each, including their menu options for Wichita Restaurant Week, or visit wichitarestaurantweek.com. Plan ahead: The event spans two weekends so you’ll have plenty of time to try as many of the restaurants as you’d like, but be sure to plan ahead. Some establishments require reservations during Wichita Restaurant Week. WRW contests: Your Wichita Restaurant Week meal could be free if you enter and win one of the 25 $25 gift certificates to be given away. To enter: 1) Take a selfie with the Wichita Restaurant Week menu of the restaurant where you’re dining or 2) Take a foodie photo with your Wichita Restaurant Week meal at one of the participating restaurants. Post your photo on the event’s Twitter or Facebook accounts with hashtags #ICTdining and #WRW17 along with the name of the restaurant where you are dining. Winners will be randomly selected between Jan. 20-29. The cause: Since 1990, the Boys & Girls Clubs of South Central Kansas has provided young people with one-on-one relationships with caring adult professionals and fun, age-appropriate programming to nurture kids’ self-esteem. The 2016 Wichita Restaurant Week event raised $10,000, enough to provide 9,444 out-of-school meals for Wichita children and enough snacks for seven months of club activities.